Multiplexing can be best discussed at three levels - vehicle, ECU or component, and IC. Within each level are partitions for software and hardware, and within each partition are divisions of functionality such as buffer size. The content in this book will help the reader to acquire a basic understanding of vehicle multiplexing systems, primarily from the passenger car and light truck viewpoint. Some discussion of heavy-duty and off-road vehicle multiplexing is presented, along with a look at industrial automation - a fast-growing multiplex field already eclipsing automotive usage. 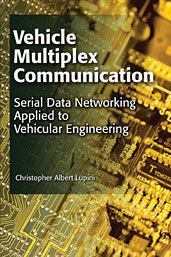 If you do not have access to SAE MOBILUS via username/password or institutional access, you can still purchase the Book, Vehicle Multiplex Communication.